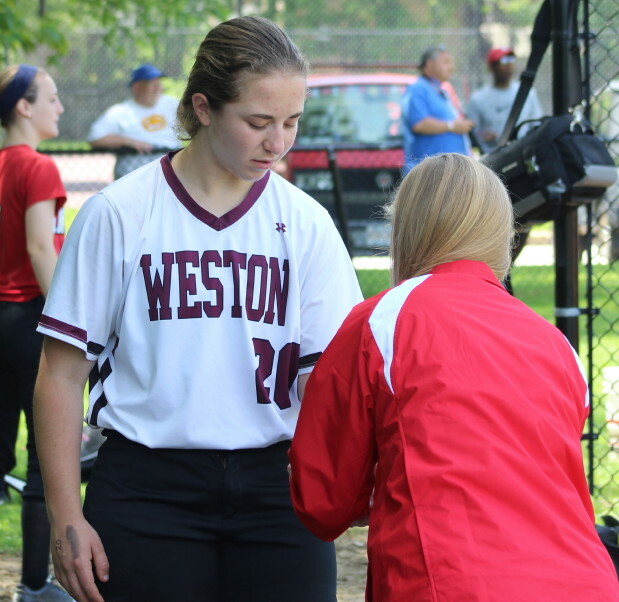 (Amesbury MA) Amesbury overwhelmed Weston, 17-1, in Division 3 North first round action Sunday afternoon at Amesbury. The mercy rule kicked in after the Wildcats batted in the top of the fifth inning. With the win, Amesbury moves ahead to the quarterfinals on Tuesday afternoon (4PM) hosting Notre Dame of Tyngsboro. Weston (9-12) rolled up twenty-five runs in their preliminary round victory against New Mission two day ago. 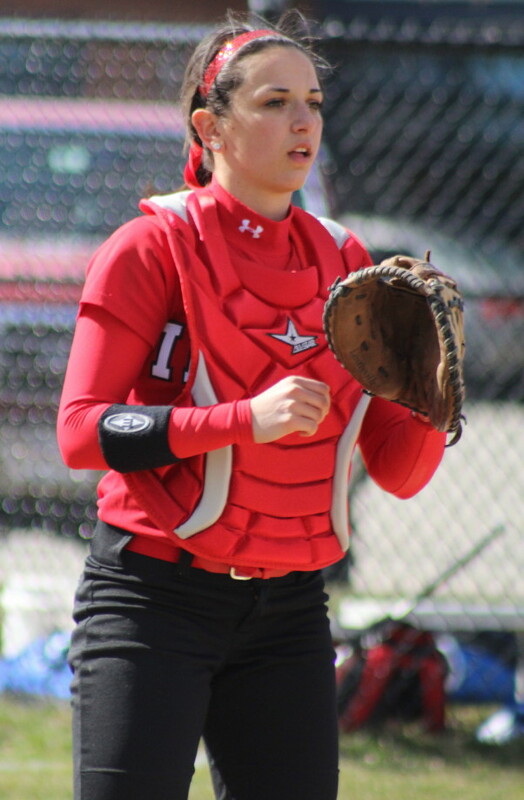 Nothing like that happened today, however, against Rachel Cyr as the AHS senior limited the Wildcats to two hits (Gene Miller) and one unearned run. Because the game was shortened, the Indians (15-6) had only four innings of at-bats and they made the most of them. There were seventeen Amesbury hits with everyone in the starting lineup getting at least one. 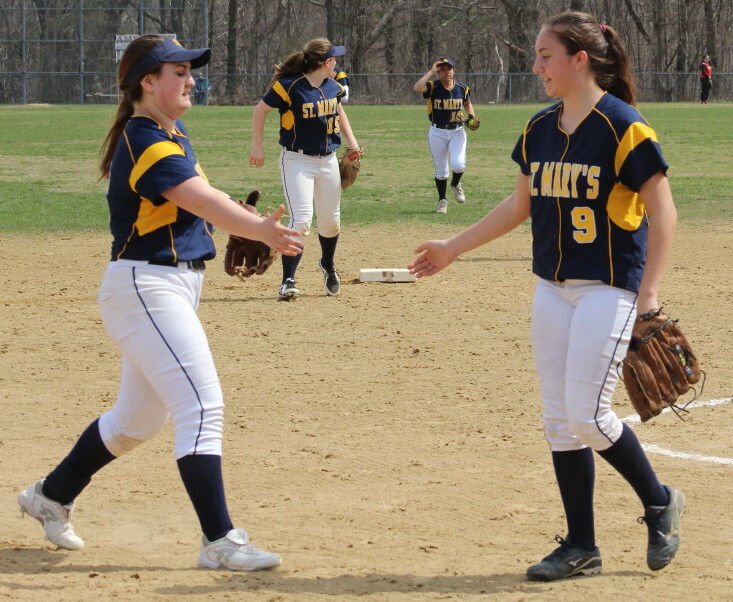 The only extra base hits were by Lauren Fedorchak (triple) and Amanda Schell (double). Anyone at this game asked to explain it won’t be starting with Weston’s lack of hitting or Amesbury’s ability to hit. They would probably start with the very shaky Weston defense. 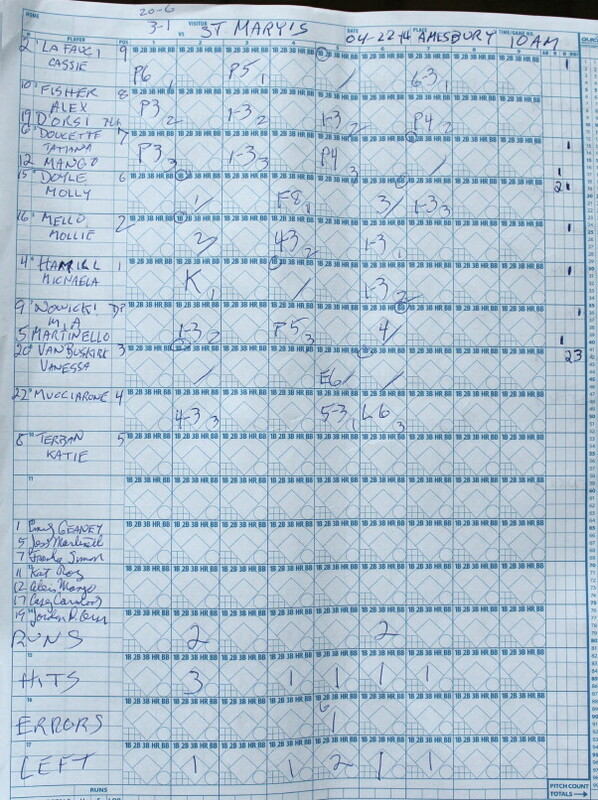 The Wildcats committed eight errors, by my count, including four in the first inning when Amesbury put up seven runs. For some reason, both good defense or bad defense can be contagious. In this case, the inability to make plays in the field enveloped the visitors from the Dual County League. And Amesbury just aggravated the situation by putting ball after ball in play for four innings. 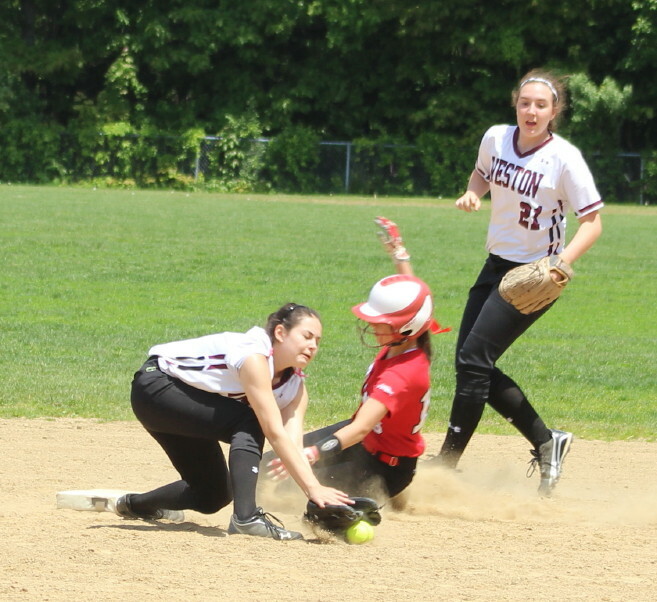 What looked like minor damage by Amesbury in the first inning (two runs), due to two fielding miscues (Gene Miller and Katie Valle), became major damage (seven runs) when two more errors (Katie Valle and Naomi Silverstein) followed before the end of the inning. The Indians added four runs in the second, two in the third, and four more in the fourth. AHS coach Chris Perry had all of his reserves in action before this one ended. 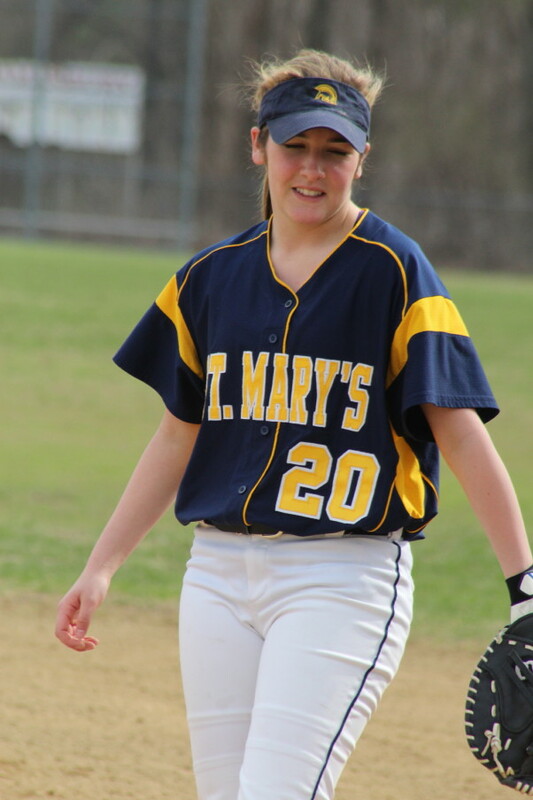 Sophomore Megan Reid came off the bench to single in the fourth inning. 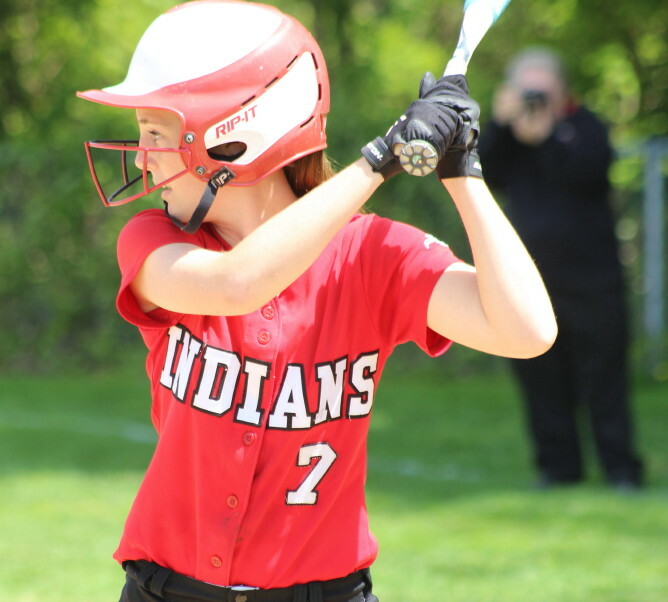 Amanda Schell and Alexis Boswell led the way for Amesbury with three hits apiece. 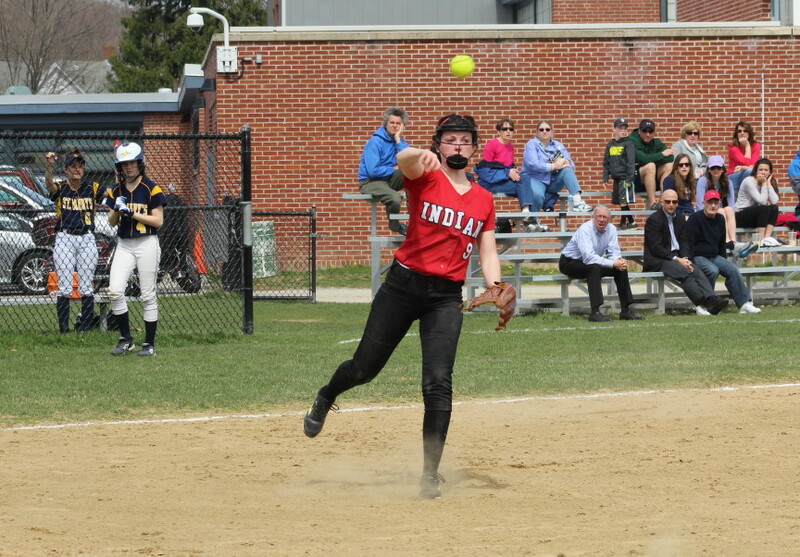 Lucy Scholz, Zoe Fitzgerald, and Lauren Fedorchak each had two hits for the Indians. The Wildcats collected their lone run in the fourth inning. 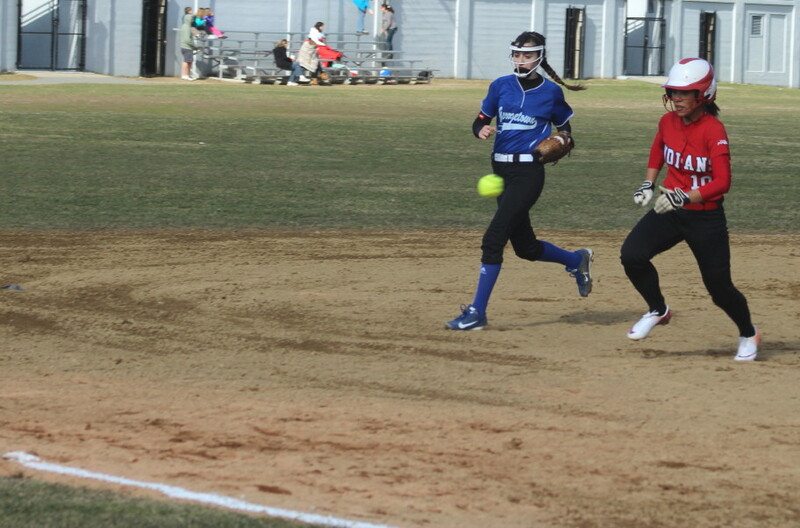 Alison Heilbronner’s bunt was thrown away by 3B Autumn Kligerman allowing Alison to get second. A wild pitch moved Alison to third and from there she was singled home by Gene Miller. Weather? The only concern might have been from a possible sunburn! 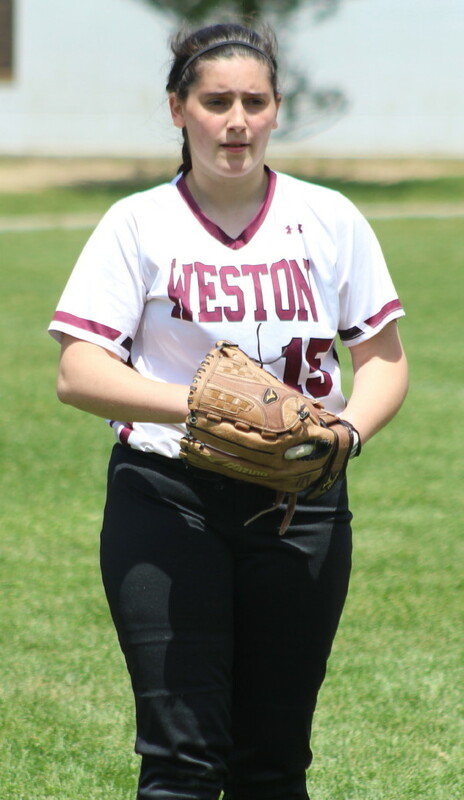 Sophomore Maddie Piccione took the loss for Weston. The less said about the support behind her the better. 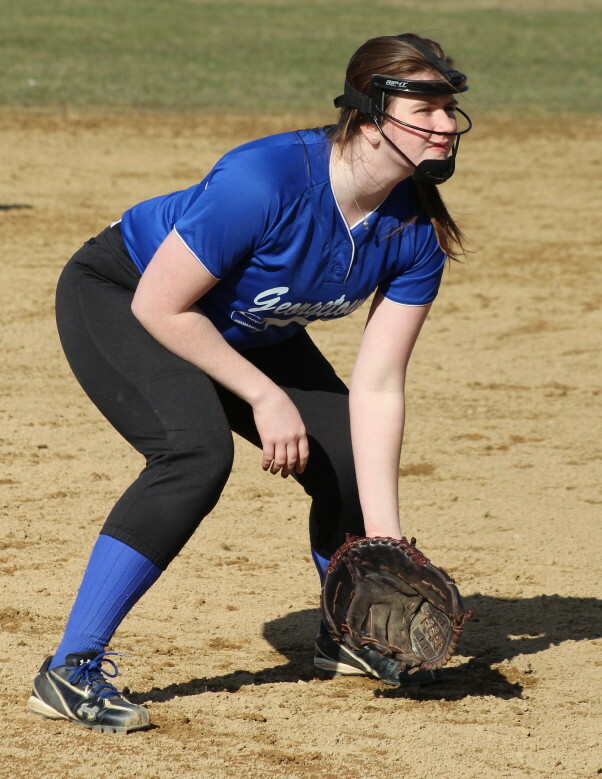 Rachel Cyr will be going to Salem State next year to play softball. 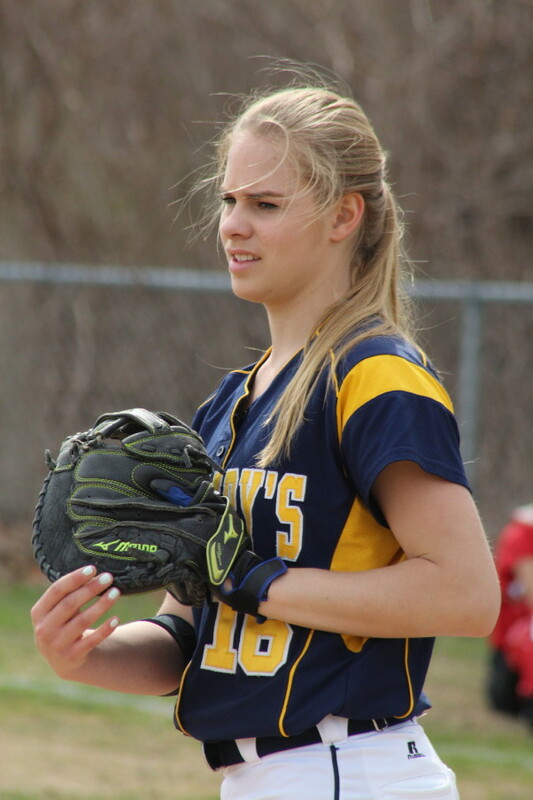 Cape Ann League softball Player-of-the-Year (Amanda Schell) will attending Ithaca (NY) to play field hockey for the D3 Bombers next year. I wonder if the softball coach knows about her? Amesbury had a nice speaker system in place for the game and we heard the National Anthem as well as batter identifications. The scoreboard was also used. Zoe Fitzgerald (#21) gets cheers from her teammates after circling the bases in the sixth inning. 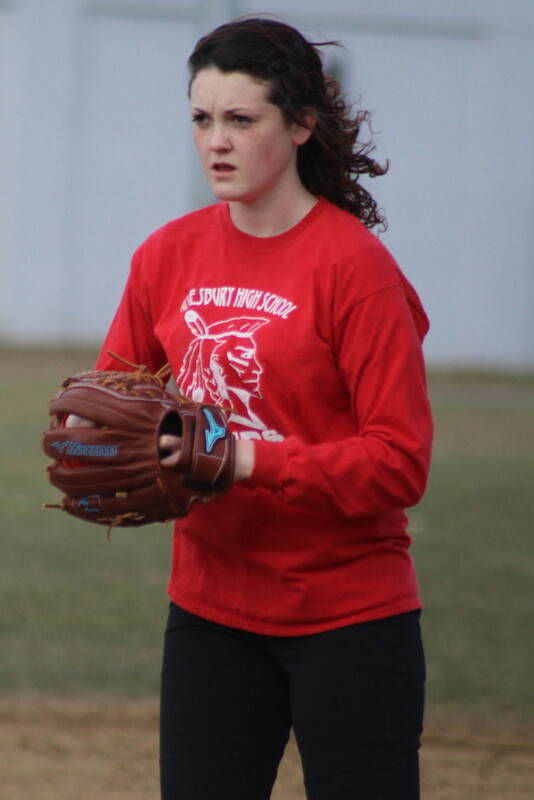 (Amesbury) Experienced Amesbury opened their 2014 season with a 5-1 victory over Georgetown on a blustery Wednesday afternoon in Cape Ann League softball. The Indians (1-0) were flawless in the field and capitalized on the inexperience of the Royals (0-1) especially in the outfield. 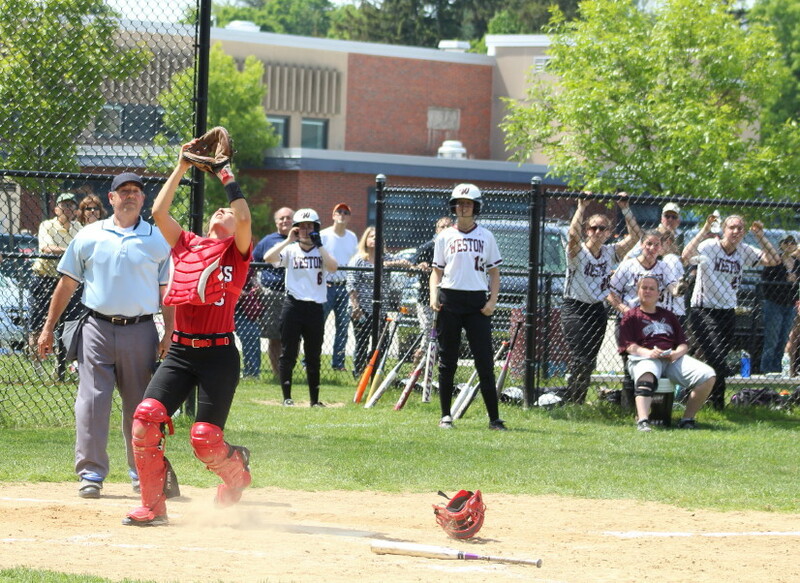 Minus graduated hitters such as Ashley Valme, Janine Fatal, Erin Leary, and Cassie Schultz, Amesbury couldn’t separate from the determined Royals. 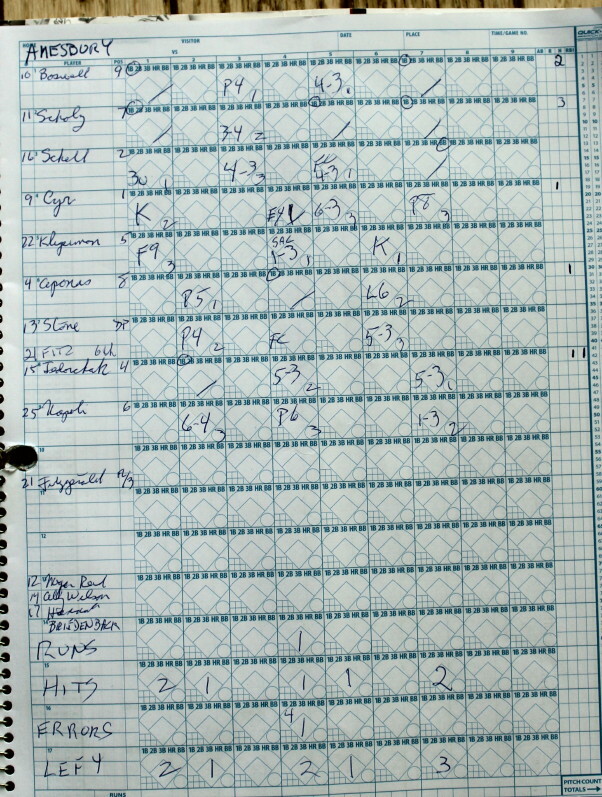 This was a 3-1 game going into the bottom of the sixth inning. In the decisive sixth, sophomore Zoe Fitzgerald hit a hard shot into right center that split freshmen outfielders Samantha Newbury and Dana Edwards on the ground. 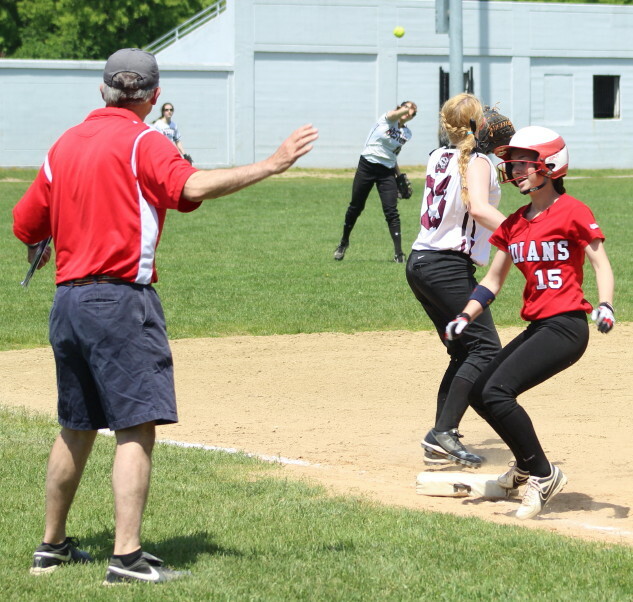 By the time the two outfielders could retrieve the ball, and get it back into the infield, Zoe had reached home (with Amesbury’s 4th run) without a slide despite slowing up at third base. The Indians added more insurance in the same frame. Lauren Fedorchak singled to deep short and took second on a wild throw by SS Maddy Crateau. 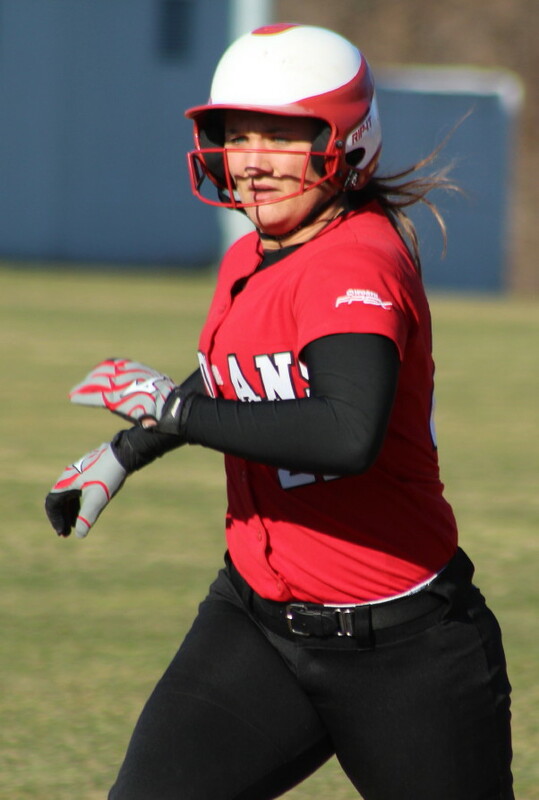 Lauren then scored Run #5 on freshman Maddie Napoli’s blooper into right field. 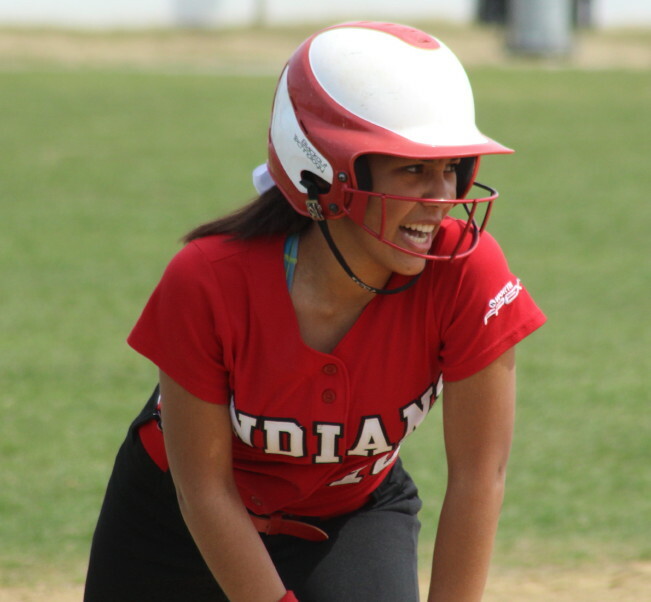 Senior Alexi Boswell worked some base running magic to produce a run in the first inning. After Alexi reached on a single, Lucy Scholz put down a bunt that activated the Georgetown infield. 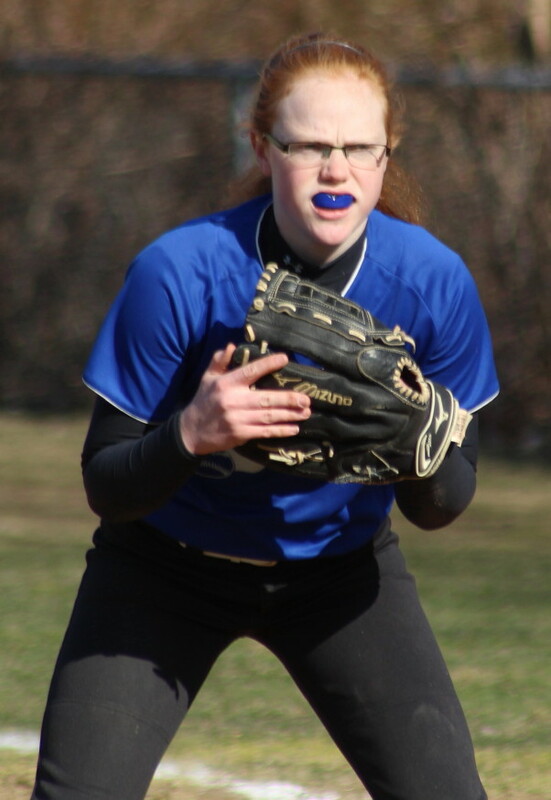 Third baseman Hannah Jannell fielded the bunt and made an accurate throw to second baseman Maddy Crateau covering first to get Lucy. However that defensive arrangement left shortstop Kylie Hayward covering both second and third. So Alexi ran right past second toward uncovered third. 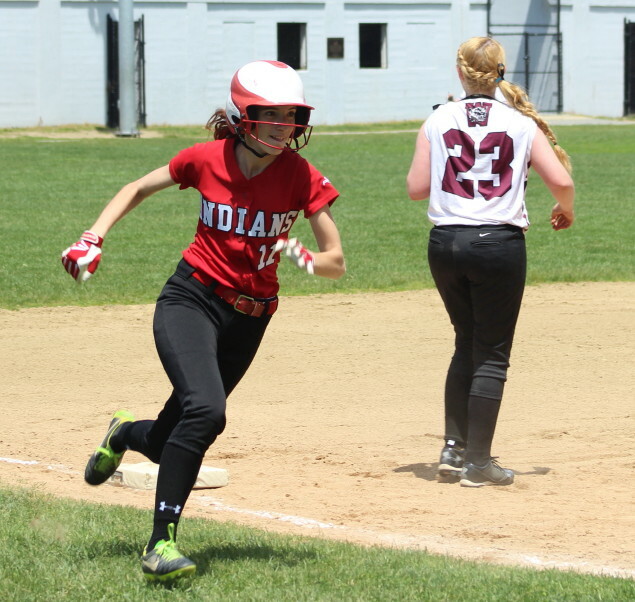 Maddy Crateau threw the ball past shortstop Kylie Hayward who was racing Alexi to third and Alexi came home with Amesbury’s first run. More of that inexperience/experience thing kicked in for a second first inning run. 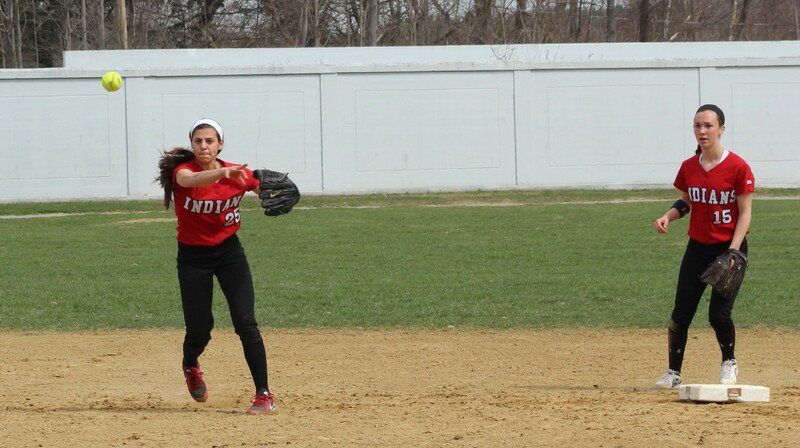 Senior Amanda Schell singled to right but the ball got past rightfielder Dana Edwards and Amanda ended up at third. Senior Rachel Cyr singled to center scoring Amanda with Amesbury’s second score. When Autumn Kligerman hit a fly ball to center that centerfielder Samantha Newbury couldn’t find in the sun, you sensed that a very bad inning was underway for the Royals. But credit Georgetown starter Danielle Quercia. 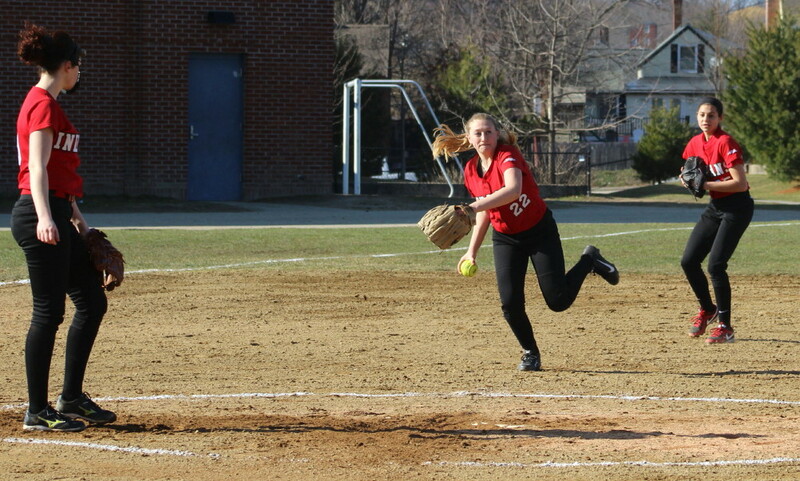 She got Zoe Fitzgerald to strike out and Sammy Stone to line to first ending the inning without any more runs allowed. Amesbury would build their lead to 3-0 in the second inning. 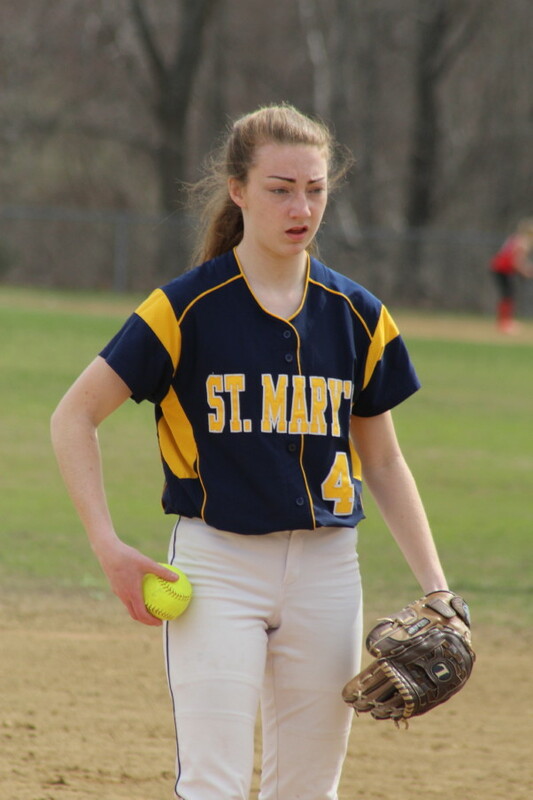 Lauren Fedorchak singled to center and Maddie Napoli sacrifice bunted her to second. Lucy Scholz delivered Lauren with a two-out single to center. Georgetown had five hits, a walk, and five stranded runners to show for five innings of play. In the sixth the Royals used aggressive base running to get on the scoreboard. Maddy Crateau and Jen Nutter set the stage with infield hits after one out. 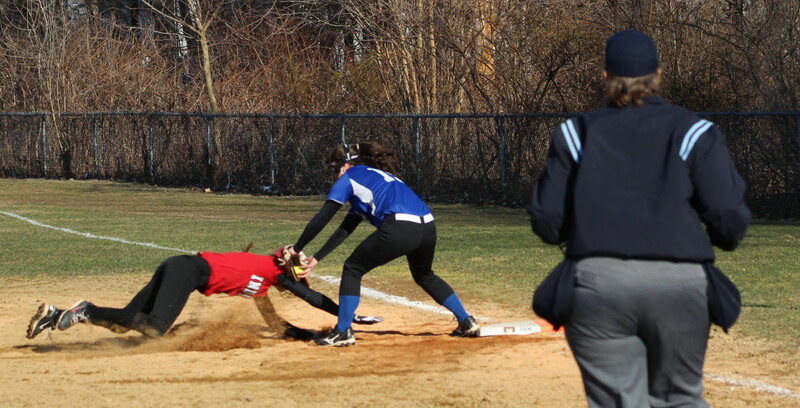 When catcher Amanda Schell tried to pick Jen off of first (it was verrry close!) Maddie reached third. 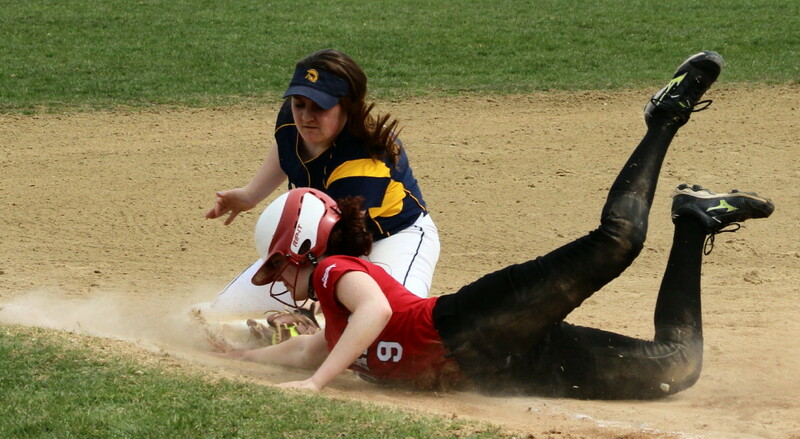 And then when Jen stole second on another very close play Maddy raced home. 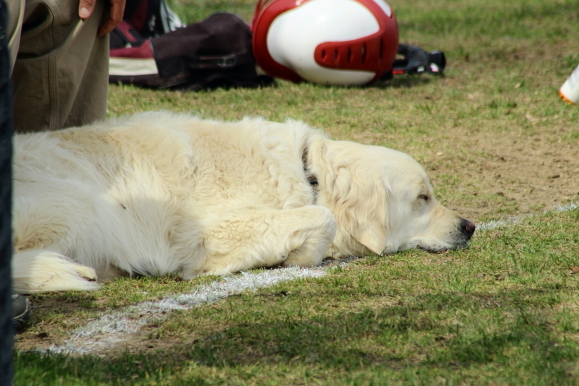 The key to that inning for Georgetown was being aggressive. The key for Amesbury was Rachel Cyr. How? The senior pitcher struck out three Royals looking to keep other Royals off the bases and limit the damage to one run. Former CAL All-League shortstop Amanda Schell made her debut at catcher for the Indians. Amanda replaces Cassie Schultz who is now playing at Assumption. Rightfielder Alexi Boswell showed her arm in the seventh inning. 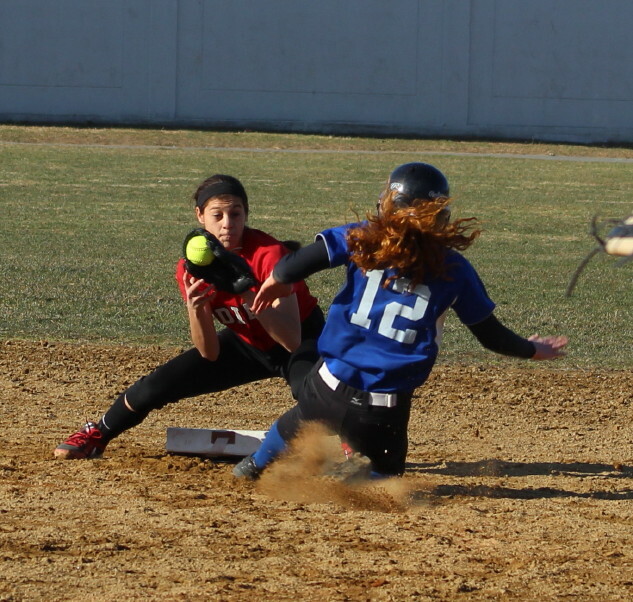 When sophomore Maggie Noelk hit a liner to right, Alexi picked up the ball on the hop and threw Maggie out at first. 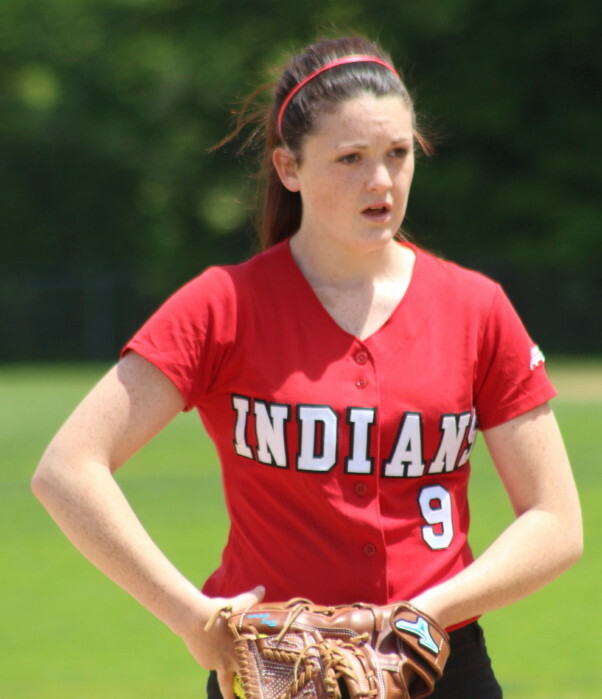 Amesbury starter Rachel Cyr allowed seven hits, one walk and struck out four. She also successfully handled three chances. Rachel, who replaces Carolina Merrill, will do most of the pitching for the Indians. 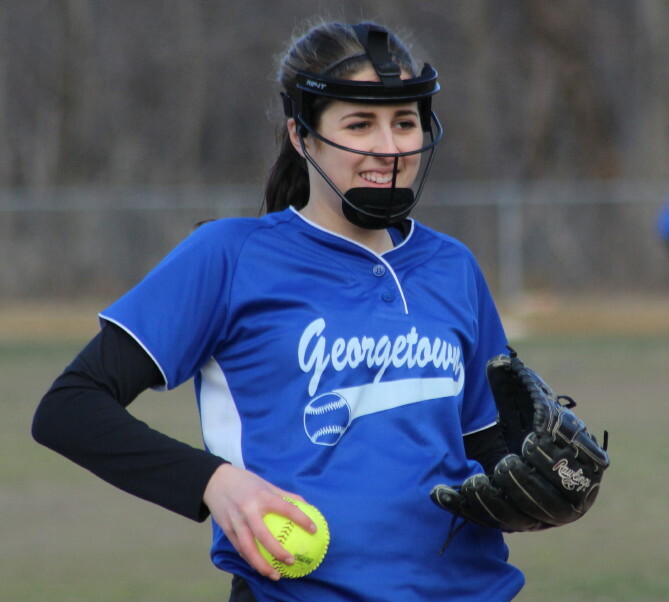 Georgetown starter Danielle Quercia gave up eleven hits but only five runs despite four errors behind her. Danielle ends a run of eight years of the Erlandson sisters pitching. Amesbury was 19-3 last season while Georgetown was 14-6. Both teams are now in Division 3. Jen Nutter led Georgetown with two hits. 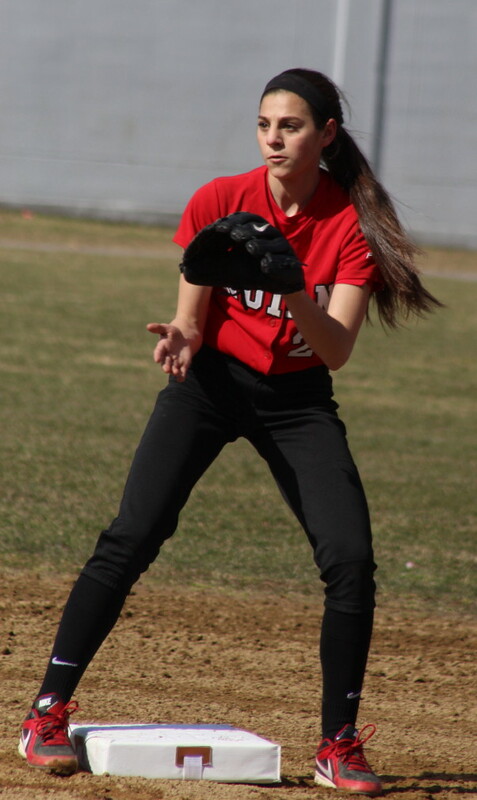 Amanda Schell, Autumn Kligerman, and Lauren Fedorchak each had two hits for Amesbury. Tough second inning for Georgetown. Jen Nutter singled and reached second on a wild pitch with no outs. 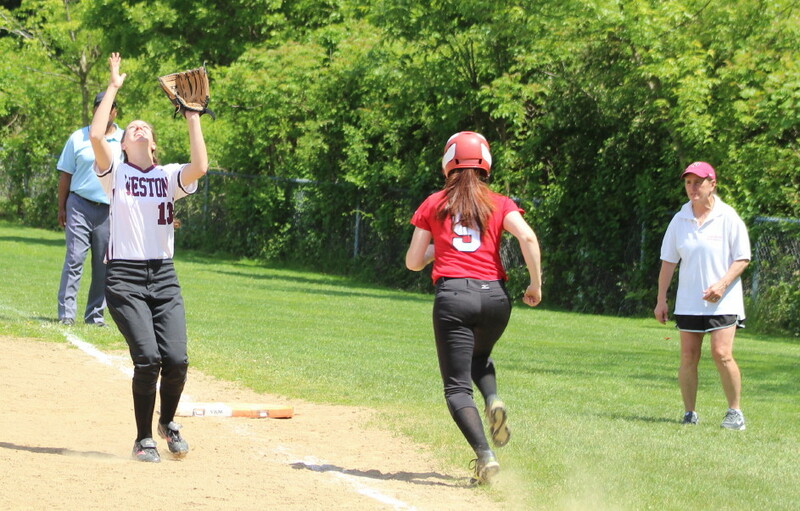 However, Emily Fraser lined to Autumn Kligerman at 3B and the Amesbury junior doubled Jen off of second. 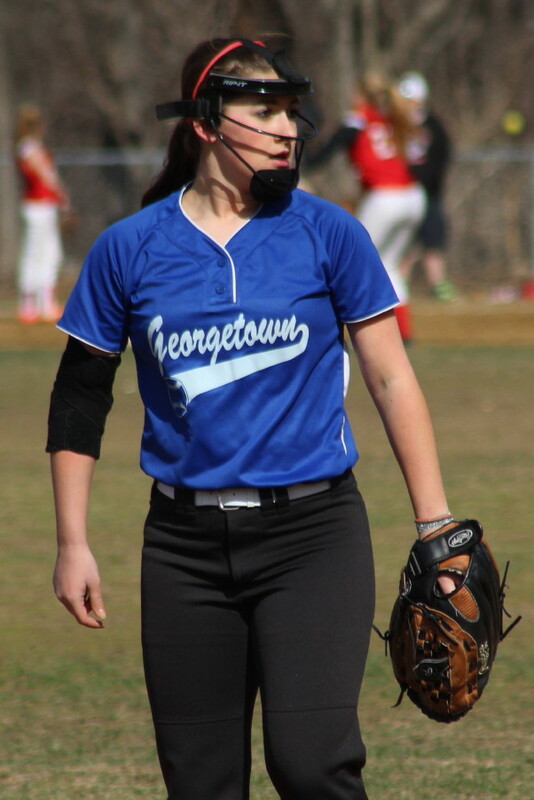 As bad luck (for Georgetown) would have it, next batter Hannah Jannell singled to center. Could have been a run?? 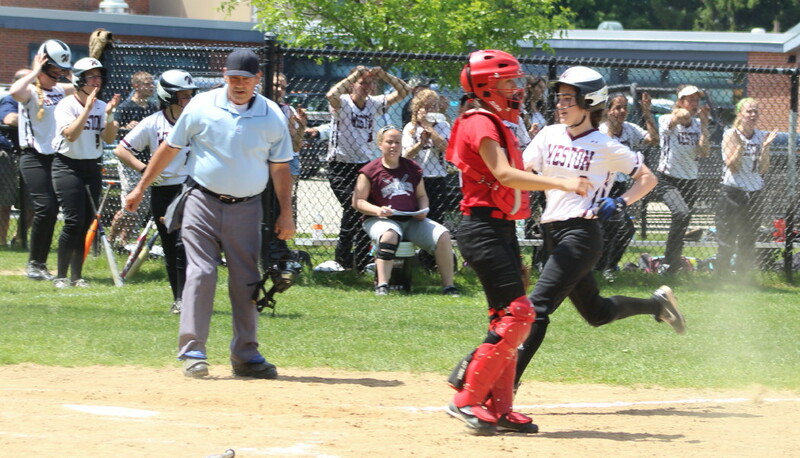 Amesbury junior Meagan Aponas had a pinch-hit single in the 6th but got caught in a rundown. The game was originally scheduled for Georgetown but field conditions there weren’t good. The temperatures were in the 50’s but the gusty winds made that number meaningless when it came to deciding what to wear. Dress for winter until further notice!